Light lasts three yoctoseconds to go through a proton. If a second would be the age of the universe, this time would be one million times faster than an eye blink. But such a short time is apparently enough, in certain types of collisions at the Large Hadron Collider (LHC) at CERN, for the quarks and gluons that form the proton to lose quantum coherence, interact among themselves and form a new state of matter, known as the Quark Gluon Plasma, that filled the whole universe some microseconds after the Big Bang. 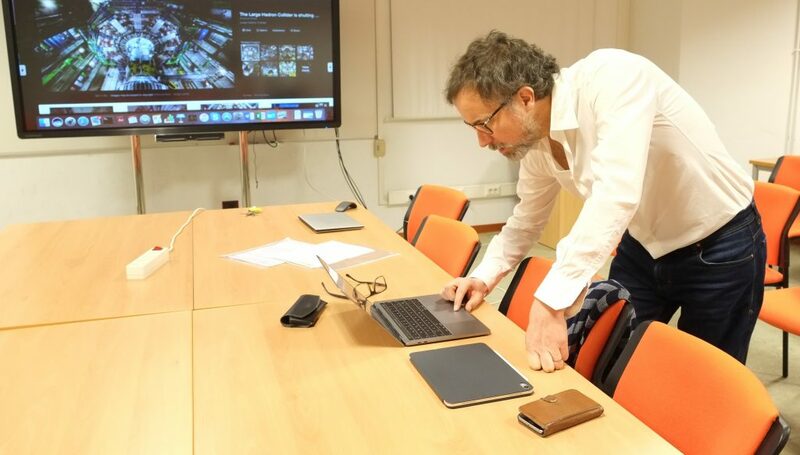 The European Research Council (ERC) has just awarded IGFAE’s director, Carlos A. Salgado, a 2.5 million euros Advanced Grant to study fundamental aspects in the formation of this new material in particle colliders. The name of the project: “Yoctosecond imaging of QCD collectivity using jet observables” (YoctoLHC). Researchers from the Laboratório de Instrumentação e Física Experimental de Partículas (LIP) in Lisbon and from the University of Jyväskylä in Finlandia will take part in the project. QCD is the only sector of the Standard Model where the exploration of the first levels of complexity, built from fundamental interactions at the quantum level, is experimentally feasible. An outstanding example is the thermalised state of QCD matter formed when heavy atomic nuclei are smashed in particle colliders. Systematic experimental studies, carried out in the last two decades, overwhelmingly support the picture of a deconfined state of matter, which behaves as a nearly perfect fluid, formed in a very short time, less than 5 yoctoseconds. The mechanism that so efficiently brings the initial out-of-equilibrium state into a thermalised system is, however, largely unknown. Most surprisingly, LHC experiments have found that collisions of small systems, i.e. proton-proton or proton-lead, seem to indicate the presence of a tiny drop of this fluid in events with a large number of produced particles. These systems have sizes of 1 fm or less, or time-scales of less than 3 ys. To add to the puzzle, jet quenching, the modifications of jet properties due to interactions with the medium, has not been observed in these small systems, while jet quenching and thermalisation are expected to be controlled by the same dynamics.